One that’s definitely worth a visit is Saint Etienne du Mont in the Latin Quarter just a block from the more-often toured Pantheon. 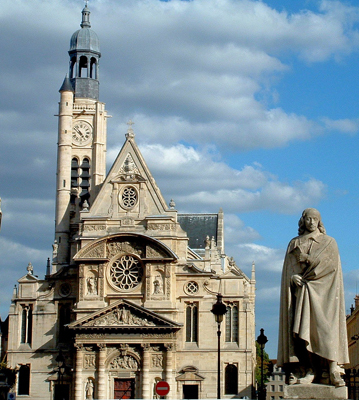 Why should you add Saint Etienne to your sight-seeing itinerary? 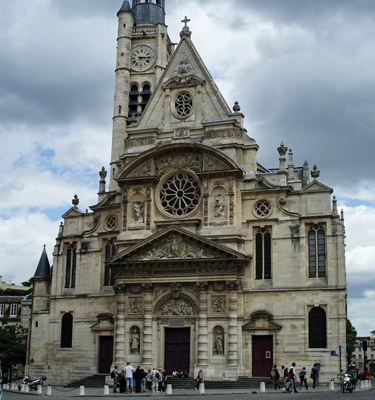 Well, not only does the church’s history stretch back more than 1,500 years but it also contains the shrine of Saint Genevieve, the patron saint of the City of Paris. And it’s one of the rare churches in the world (outside of Italy) where two Popes have held Mass. 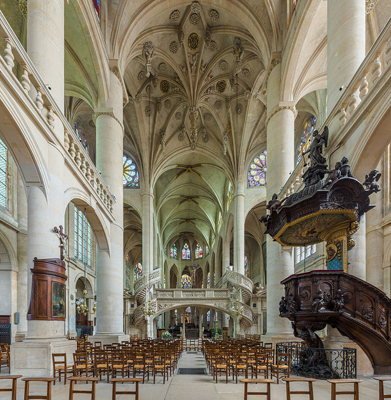 Saint Etienne du Mont was founded as an abbey—the Abbey of Sainte Genevieve—in the 6th century on the Left Bank site where the saint (who was said to have led a “prayer marathon” that saved Paris from Atilla the Hun) was buried following her death in the year 512. The abbey was replaced with a larger church in the year 1222 and re-dedicated to Saint Etienne, a deacon in the early Christian church who was stoned to death for heresy. The Gothic church was enlarged in 1328 to accommodate a rapidly rising population on Paris’s Left Bank, mainly due to the opening of the Sorbonne and other colleges in the area—some on the territory of the parish itself. But that structure was torn down in the 15th century to make room for a new, larger church. Construction began in 1494, and continued for more than 130 years—the apse and bell tower were planned in 1494, the first bells case in 1500, the frame of the church raised in 1537, the loft built between 1530 and 1535, the windows and statues commissioned in 1541, the first stone of the nave laid in 1610, and the church finally dedicated by the archbishop of Paris on Feb. 25, 1626. The Romanesque tympanum (a semi-circular carving) above the church entrance, titled “The Stoning of Saint Stephen,” was completed by French sculptor Gabriel-Jules Thomas in 1863. Other unique features of the church are a 16th century rood screen—a stone arch separating the nave from the chancel of the church that is marked on each side by ornate spiral staircases, a carved wood pulpit and a chapel that contains 16th century stained glass. Saint Etienne du Mont was one of the largest, most beautiful and most prestigious churches in Paris throughout the 17th and 18th centuries, and as such became the final resting place for such well-known French dignitaries as mathematician, physicist, inventor and writer Blaise Pascal; playwright Jean Racine; physician, scientist and political theorist Jean-Paul Marat, royal tax collector and scientist Pierre Perrault, painter Eustache le Sueur and Louis-Isaac Lemaistre de Sacy, a priest and theologian whose translation of the Bible became the most widespread French Bible in use during the 18th century. Saint Etienne du Mont has been the site of two papal Masses: In 1805, Pope Pius VII celebrated Mass in the church, followed by Pope Jean Paul II in 1997. 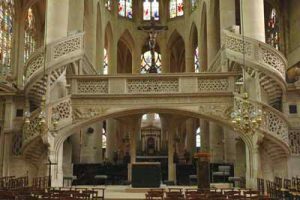 Like many churches in Paris, Saint Etienne du Mont was closed during the French revolution and later turned into a “Temple of Filial Piety.” Catholic worship resumed in 1801. Sainte Etienne du Mont is located at Place Sainte-Genevieve, which is located just behind the Pantheon (Metro: Cardinal Lemoine). The church is open to the public Monday noon-7:30 p.m., Tuesday-Friday 8:45 a.m.-7:0 p.m., Saturday 8:45 a.m.-noon and 2-7:45 p.m., and Sunday 8:45 a.m.-12:15 p.m. and 2:30-7:45 p.m. This entry was posted in Beauty of Paris, Churches, History of Paris, Latin Quarter, Left Bank, Religion and tagged Blair Pascal, Eustache le Sueur, Gabriel-Jules Thomas, Jean Racine, Jean-Paul Marat, Louis-Isaac Lemaistre de Sacy, Pierre Perrault, Saint Etienne du Mont, Sainte Genevieve by Bob Adams. Bookmark the permalink.